As a part of my renaissance, I realised that I needed more than just a new system. After all, the crunch is only a small part of the game. For years, my style has been that of an emulated linear narrative game structure (not to be confused with railroading), so I decided I'd follow the OSR trail all the way. Above is the first hexmap I've ever drawn, and I have to say I enjoyed the exercise. There is a freedom in finding the terrain hidden in the graph paper. It was very different from the maps I've drawn before, and a lot easier. Good thing too, because once the map is done the work begins. As I drew in the shoreline, smaller islands, rivers, mountains, and towns, the Dominion of Langrim began to take shape in my imagination. And so did the process necessary to build a sandbox. Whereas my normal settings develop around the PC's, this one needs to be ready for them to move around in from roll one. Now I do not intend to micro-plan every hex, but I want to have the important locations, monsters, and NPC's committed to text and table. One thing I can say for sure is that the pre-campaign prep work is a lot heavier using this model. The map template I found on The Welsh Piper proved to be just what I needed. I'm not quite sure whether I'll keep the 1 hex/25 miles or not, but the combination of square and hex grid, and the notes/legend field on the right, makes for a user friendly map. I also find I have to keep my imagination in check while writing the background material for this setting, as I do have a tendency to spin intrigues around every NPC I come up with. This is, I believe, important in a game like this, but the nature of the game is not one of politics and scheming - unless the players make it so. Rather, what I hope to end up with is a sandbox where the NPC's do their thing, and the PC's are free to interfere as they please. If you have any advice on sandbox construction to impart, I would greatly appreciate it. I hope to have the map finalised, with description, background text, and some tables, in time for Saturday's play-date. You'll be the first to know. Hey, I like that map, but it seems like 25mile hexes would be a bit large, since it is more than can be crossed in a normal day on foot, and would take a long time to "fully explore". 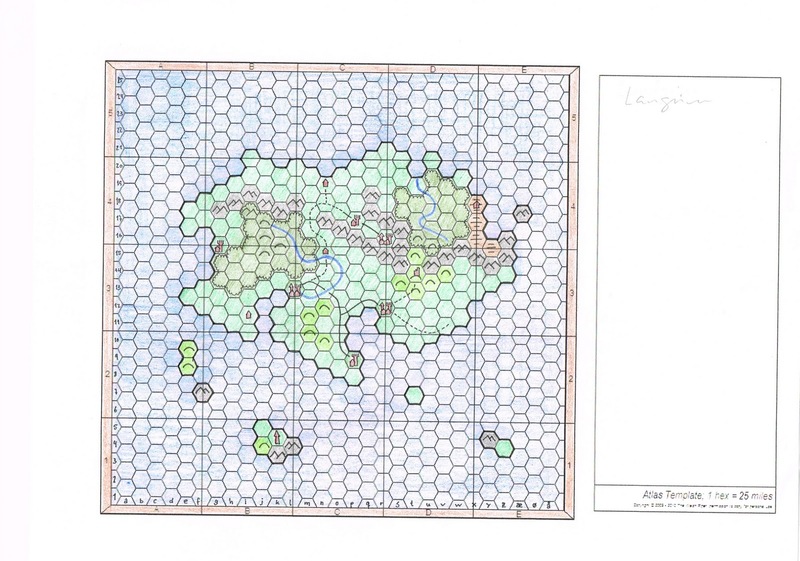 Maybe you intend to "zoom in" on this map and have smaller hexes? I do not think I'll have a "zoom-map", if for no other reason than to save me work. My thinking is that while a 25 mile hex can't be explored in a day, it can be crossed on foot. On level ground, or following roads over rough terrain, one can march that distance with relative comfort in a day. To thoroughly explore it would take a lot longer, depending on the terrain and what's being searched for. I've been weighing my options carefully over the last couple of days, and I think the current scale makes sense. 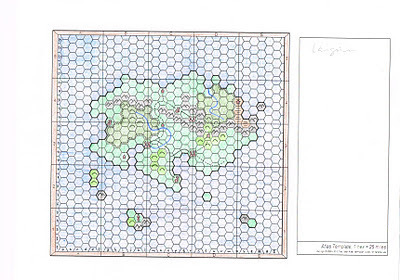 The island is rather small (~12x20 hexes), but still large enough to hypothetically support what I'm putting on it. And as an added bonus, it's size should allow the players to become familiar with it relatively quick. I'll explain: I usually draw a map of a whole area (something like might get published in a fantasy novel) to get the creative juices flowing. Once I have a rough idea and whatever geopolitical scope I desire (be it country or continent) then I pick I starting location, and draw a more detail local map, usually focused around one city. My level of detail usually isn't uniform, but then falls off with distance from the "starting point." That's exactly how I've been doing it, and while I'm trying to take a different approach here, I will probably end up doing something similar in the end. If for no other reason than to have what I need to be ready for play on Saturday.